Getting the best mattress topper for side sleepers is an economical way to get a good night’s sleep. The mattress topper is an additional layer that you can place over your mattress. It helps in adjusting various shortcomings. It can either be increasing the firmness of your mattress or making them cool. However, things become even critical when it comes to side sleepers. Why? It is just because of their sleeping posture that puts an excessive burden on the shoulders and hip area. Consequently, it becomes important for them to get a proper sleeping place. The too soft or too hard mattress might cause long-lasting joints or back problems. Considering all these facts, we have come up with some solution. We are going to review the top 8 best mattress topper for side sleepers in 2019. These reviews will throw light on various crucial aspects of mattress toppers. It will then assist you in choosing the most appropriate option for your bed. The top mattress in our list is ExceptionalSheets Rayon Cooling Topper. What makes it capable of securing top position? The thing most distinguishing about this topper is its material. It is not just a single material. Rather, a combination of various materials works together to give you a flawless sleeping experience. The filling material of this topper is Revolt. It is the latest fiber filling. How does it play a role in elevating your comfort? This Revoloft basically works as a healthy alternative of goose and duck down. It provides the real feel of down by simply eliminating allergies and feathers issue. In this way, you can enjoy the texture of the natural element without facing its possible problems. Another factor that makes it outstanding is bamboo cover material. What’s the benefit? It doesn’t let you sleep hot. The testing of different materials has shown that bamboo is effective in removing body heat. It takes away the heat at the initial state of touching. Thus, it helps in making you sleep cooler and comfortable. The backing of this topper is made up of 30% cotton and 70% Polyester. Its skirt contains 76% Polyester, 16% Nylon, and 8% Spandex. Additionally, its skirts are also well-fitted. It makes the topper stay on your mattress. Besides being cool and comfortable, this topper is hypoallergenic as well. Thus, it is equally suitable for people with special health conditions. The credit for this trait goes to its highly developed filling material. This topper comes with 160 thread count cover along with double needle baffle box stitch. In this way, the filling of the topper stays intact in its place instead of shifting around. Be careful while putting it in the washing machine because some users have faced damage to it. With its bamboo material, it keeps you cool and prevents overheating. Due to its advanced filling, it feels super soft and comfortable. It is hypoallergenic and keeps you healthy and safe. This certified mattress topper comes with a money back guarantee. It might make your bed sheets slip away. 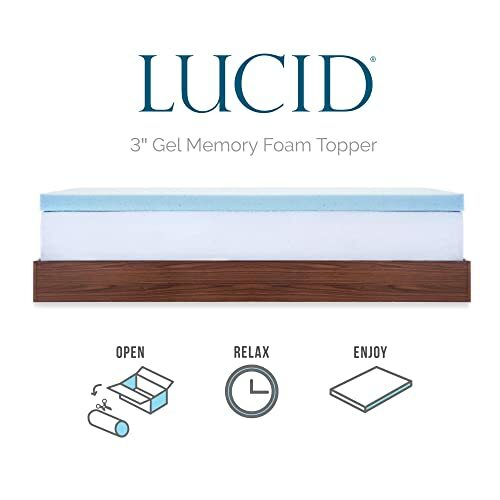 2nd best mattress topper for side sleeper in our list is the LUCID topper. This three inches thick topper literally provides everything you might need to have peaceful sleep. How does it fulfill various requirements? The LUCID has combined a variety of materials in its single adequately thick topper. In this way, it resolves your mattress issues without letting you spend a hefty amount on a new mattress. The main foam layer of this topper is memory foam. With its therapeutic effects, it properly aligns your body while eliminating pressure points. It also has the capability of contouring your body well. These traits make it capable of providing spinal alignment. It thus results in making this topper especially suitable for side sleepers. Another worth mentioning attribute is its ventilated design. It allows adequate airflow and assists in regulating temperature. In this way, this topper gives breathability while making you feel comfortable and fresh. Not only this, but it also gives a proper confirming feel to the sleeper. It cradles your body and makes you sleep ache-free. Well, you might be thinking its memory foam may cause over-heating? Luckily, this is not the case with this topper. It contains superior infused gel material. This gel imprisons the heat and distributes it. In the result, you won’t need to sleep hot. This LUCID topper will keep you sweat-free. Another remarkable trait of this topper is its Lavender infused layer. Merely, its name is enough to show its functioning. It makes you relax by creating calming surroundings. In order to further elevate your comfort level, this topper comes with Bamboo Charcoal material as well. What does it do? It helps in managing odor and moisture. Apart from all good things you still won’t be able to use it for good effect if you’re a bulky sleeper. The memory foam offers adequate contouring and prevents back problems. The infused gel prevents overheating. It allows for adequate air circulation. With its bamboo charcoal, it prevents your topper from bad odors. The lavender layer gives a soothing and refreshing feel. It might have a slight odor in the start. This Red Nomad Topper has the capability for resolving numbers of your mattress problems. Thus, no matter, how sagging your mattress might be this topper can give you peaceful sleep. Continue reading to know about its remarkable attributes. In order to define its manufacturing quality, it is enough to say that it is a USA product. It definitely fulfills the top standards for its quality. Additionally, it has Certi-Pur US certification. Thus, you can stay assured of its high quality built-up. This mattress topper has the thickness of a good four inches. It means you can definitely go for this mattress if enhancing thickness is your foremost purpose. This item comes with the memory foam in it. Thus, it can offer adequate support to your body while cradling your body. It can also reduce pressure points. These features are particularly crucial for a side sleeper. We all know they have more pressure on their shoulder and hip area. Thus, confirming the trait of this topper can help them in having pain-free sleep. Here one thing is important to mention. As manufacturers have kept all aspects in mind, they have made topper one inch short from all sides. You must be wondering about the reason? Well, they did this to make your sheets fit perfectly over your bed. However, you would need to handle the size carefully. Besides, the whole product contains very high-quality material with professional assembly. According to its makers, you would definitely like its quality. However, if you still face any problem, the company offers its services from the refund to its replacement. With its memory foam, it reduces pressure points. It provides adequate spinal alignment. This top quality mattress topper contains Certi-Pur US certification. With its CoolFlow technology, it allows better airflow. Due to its viscoelastic comfort, you can enjoy a restful sleep. Few people might feel it very soft. You should carefully choose its size. The SleepJoy ViscO2 is one of the best mattress toppers for side sleepers due to its innovative engineering. This product instantly enhances any kind of mattress you place it on. 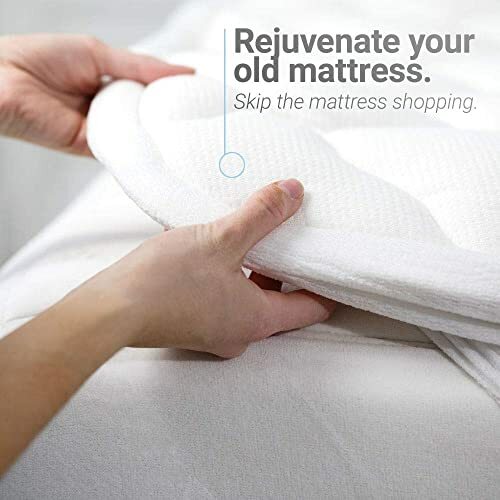 This mattress topper uses memory foam to provide comfort and relaxation while you sleep or rest. The memory foam contours itself according to your body and your position. Doing so allows your body relief from all kinds of pain such as backaches, side aches, and headaches as well. This pressure point relief will make you sleep as soundly as a baby and when you wake up, you will definitely feel refreshed. One of the major features on this mattress topper is its ventilation. The 3-inch SleepJoy ViscO2 mattress topper provides a breathable and comfortable layer for you to sleep on. Research shows that a cooler mattress means better sleep. For this reason, the manufacturers carefully designed this open cell memory foam to be able to ventilate all air flow from the sleeping surface. 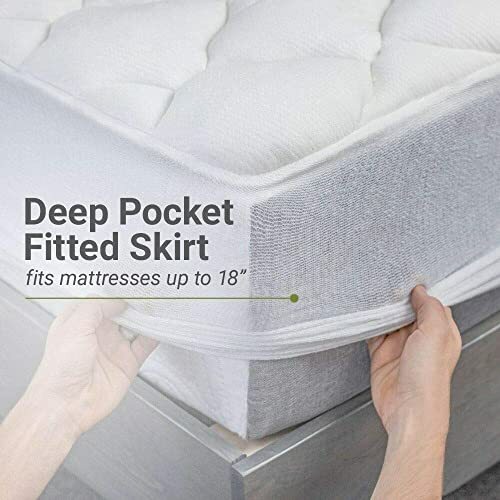 This premium memory foam is highly durable and you can rest assured knowing that this mattress topper will fully retain its shape and contouring for years to come. In addition to this, this product is quicker to set up as well. The ViscO2 uses odor free materials; you do not need to air this mattress topper out. You can simply lay it over your bed and you can start using it. The 3-inch thickness makes it a suitable choice for side sleepers as it contours well according to different body shapes which can provide great individualized support to you. The perfectly engineered elasticity can also relieve back pain. Some users have faced the side of the mattress topper turns completely yellow even though they have used the sheets but the yellowness still visible through fairly thick fitted sheets. It efficiently reduces motion transfer, thereby increasing comfort. This product is manufactured from plant-based materials making it healthier. The ViscO2 uses odorless materials which save time as you do not need to air it out. It can never suffer from prolonged shrinkage from compression or pressure. The topper is only compatible with a high-quality mattress. Linenspa has crafted the perfect topper for side sleepers to enhance their sleep experience. This mattress topper is significantly airier and features a ventilated design to help cool the body during sleep. 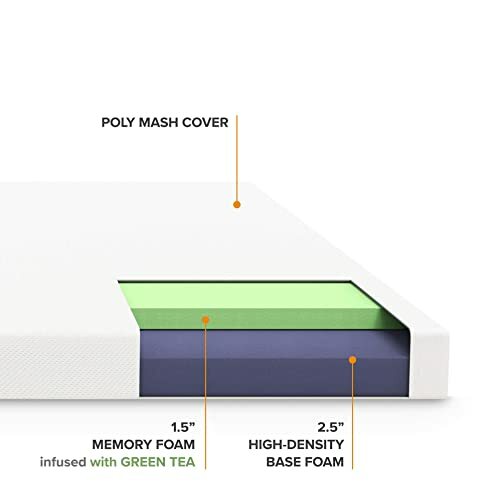 This plush 3-inch memory foam boasts a unique memory foam design. The manufacturers carefully designed a swirl pattern for the gel used in the memory foam. The gel infusion used in the memory foam topper helps to ventilate the sleeping surface. It also helps to regulate the temperature and cool down the surface, which is rather different when compared to other memory foams. What we really love about this mattress topper is the way it aligns your back and contours itself according to your body curves. 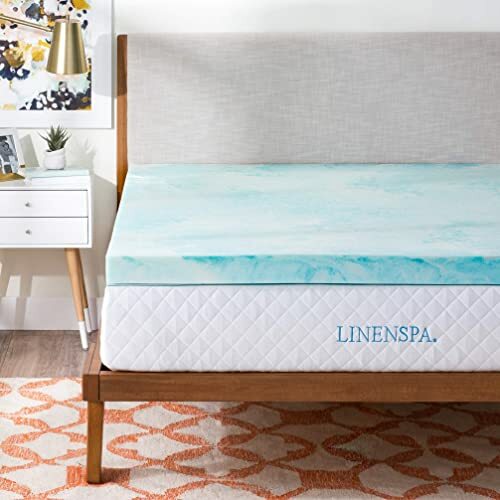 The Linenspa 3 inch memory foam uses open cell memory foam to perfectly mold itself according to your need and your body. This provides a more customized feeling as it will help reduce several bodily pains. Due to it perfectly aligning the spine, it can remove the back pain from your body almost instantly in one night. This particular product is available in other profiles as well. This includes the 2 inch and the 4-inch profiles. While all the profiles provide the same plush kind of feel, the thicker mattresses provide much more comfort and ventilation. However, thicker mattresses do cost more, so you need to keep the price in mind. We chose the 3-inch variant as it is thick enough to snugly contour itself according to your movements and body all the while keeping it easy on your pocket. However, with this, we feel it is necessary for you to know that the Linenspa 3 inch memory foam has really good memory foam. This might seem like it’s more of an advantage, but it really is not. This mattress topper is manufactured using extremely light materials making it softer and easier to sleep on. It provides ample ventilation and cooling due to the infused gel. It can perfectly align your spine and relieve back pains. This product is not shipped with a cover, so you will have to spend extra on buying one. When it comes to providing relaxing experiences with comfortable sleep, there really is no beating the Best Price Mattress’ mattress topper. Everything about it, from the way it ventilates and promotes airflow to how it uses extract to cool the sleeping surface, is the best. The manufacturers are Best Price Mattress know and fully understand that sleeping well is much better than sleeping for long hours. To visualize this concept, they have introduced Green Tea extract in the top layer of the memory foam which is 1.5 inches thick. Green Tea extract is well-known for its several agents that help relieve mental stress and provide restful sleep. These extracts also aid in making the initial mattress odors go away. When you first lay on top of the mattress topper, you might find it to be a bit stiffer than what you are used to. However, you have to let the memory foam form around your body and create a dent according to your body’s shape and curves. This topper is engineered to smartly distribute your weight across the mattress which instantly alleviates any kind of back pain which you may have. However, if you are a back sleeper, we think you would be much more comfortable with the base foam side up and the memory foam side down. One of the biggest letdowns with this product is the fact that it does not incorporate the use of gels. The memory foam, on its own, does a good job of ventilation and promoting airflow throughout the sleeping surface. However, we feel that this process is rather slow and it would have been much better and comfortable for the users if they had used gel. The Green Tea extracts used in the top layer relieve mental stress and make for a comfortable nap. The memory foam easily aligns your back and alleviates any back pains immediately. Ventilation is remarkable and instant when it comes in contact with your body. The manufacturers provide a 5-year warranty for this product. The cooling is efficient but rather slow and sloppy. The eLuxurySupply Topper is a highly versatile mattress topper which is designed to work with all kinds of mattresses. This is in part due to its thickness and various features it offers. Each eLuxurySupply Rayon Mattress Pad is filled with state of the art Revoloft Fiber. This is a unique kind of fiberfill which makes you feel as if you are using goose or duck down. However, while goose and duck down can be a real pain and stick out, the fiberfill does not provide this complication. Instead, the soft and plush feel of the sleeping surface will perfectly provide you with comfort instantly. It perfectly aligns your spine and provides pain relief especially on the back. There are no sharp hugs or bad contouring from the mattress which makes even the first try very comfortable. The fiber used for this mattress topper is a remarkable one at best. It is extremely durable and it is built to last long by maintaining its shape for an elongated period without fail. The extraordinary fiber offers the look and feel of down while eliminating the discomfort which comes with it. The fiber used in this product is made to be 100 percent hypoallergenic. Not only that, but this mattress topper also acquires double needle baffle box stitching. This prevents the filling from shifting or moving around inside the topper. The top portion of the mattress pad is 70 percent polyester and 30 percent rayon from bamboo. Both of these materials aid in ventilation and regulating the temperature of the sleeping surface. The bamboo rayon surface does an excellent job of not retaining the heat but regulating it throughout the mattress in order to provide a cooling sensation. On the downside, you’ll not find it extra thick and may sleep hot causing your limbs went numb. This is a machine washable mattress topper. The cooling on this mattress is exceptional. It lessens the sharpening of the contour or hug. It provides a down feeling but eliminates the discomfort that comes with down. You need to frequently air it out as its odors stick. The Morphiis Customizable Mattress Topper Plus lowers the pressure points on your back which may cause you to toss and turn in your bed. They are the ultimate choice for relieving and alleviating back pain. The Morphiis mattress topper reacts differently to each person’s sleep needs. 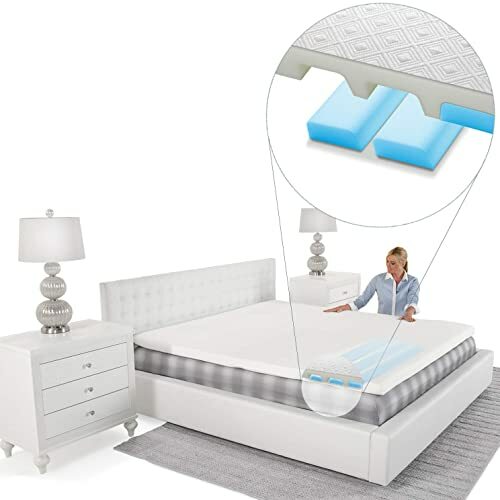 This is mattress topper provides proper spine alignment. The spine alignment is quick and comfortable with little time for adjustment. This alignment alleviates back pain as well as neck and shoulder pains. The UltraFoam is a trademark of the company. For the Morphiis mattress topper, the manufacturers have slotted the mattress at different points in order to provide adjustable firmness. This allows you to adjust it according to your own need without having to disturb the firmness of the other person sleeping on it. You can have different firmness levels on different parts of the topper without changing the entire surface. This product features 7 foams which are inserted in the bottom of the topper lengthwise. These foams allow you to fully customize the firmness of the mattress topper. They can easily be adjusted and cut. It is a rather breathable topper and ventilates the heat on the sleeping surface as well as within the mattress topper very efficiently. 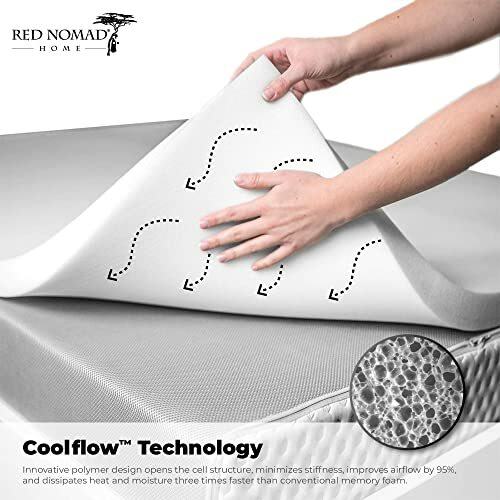 The promotion of heat flow makes it easier for you to feel cool while you sleep. This topper is 3 inches tall and provides an instant response when you lay on it. The best feature of this product is that there is practically no impression left on the topper when you remove the weight. You will not experience a sinking feeling as you use the topper which can be a huge pain otherwise. UltraFoam allows you to fully customize the topper. It does not retain impressions on the surface. The adjustment of the foams is a rather difficult process. Things can be very challenging if you are purchasing the mattress topper for a side sleeper and the very first time. It can be easier if you know what you should look for in these pads. The mattress topper would be good if it is thick. What’s the reason? It can provide better support to the body of a side sleeper. It will also give additional cushioning. Besides, it will be even better for its robustness. The thicker topper will last longer as compared to the thinner one. But, how much thickness you should go for? If you become successful in getting them with a thickness of 2 or 4 inches, it’s completely fine. In a few cases, toppers with 2-2.5 inches can also do well. However, the condition is, the material should be good. Here it is worth mentioning that you can also get some higher quality topper with less thickness as well. All in all, we would ask you to go for a thicker option as it will be able to give better cushioning for the side sleeping position. It is another important aspect you cannot ignore while buying the mattress toppers. The things become even more serious if you are a side sleeper. Your mattress topper must be capable of giving adequate pressure relief. Though this attribute is necessary for all sleepers, side sleepers have a burden on uncomfortable points. It is on their shoulders and pelvic region. Thus, if your topper could not offer enough pressure relief, you would face a lot of discomforts. It can even end up into you having long lasting back pain and other aches. Which material in mattress topper is the best for a side sleeper? Well, we can’t answer it specifically. The reason is it varies from person to person. There are different material options available in the market. They are memory foam, wool, latex, and modified down. All these materials have their specific pros and cons. You can choose them according to your requirements and budget. For density, we would say the more dense option would be better. Why? It is because it would last longer. If you opt for the less dense option, it would wear out within the matter of a few months. After that, your topper won’t feel comfortable at all. Therefore, if you are looking for some long lasting reliable item, then go for a denser mattress topper. There is another point as well. The denser topper might feel too firm in the start. However, it can settle with the time if you can’t compromise with the longevity of your mattress topper. Things might get tricky when you talk about firmness. It is because you need the option that should give required support and should be soft too. The issue is you can’t ignore either aspect. You need your topper firm enough to hold your critical points right up. On the other hand, it should not feel hard on your body. If you choose a less firm option, it will feel super comfortable. But, after some time, it will make your body sagging. It will fail in providing spinal alignment. The result would be aching back, shoulders, and pelvic region. Contrarily, the super firm mattress would give perfect support while offering zero comforts. It would again end up into your body parts aching badly. Considering all these points, you should go for some middle option. Your selected item should offer you the required to support and comfort simultaneously. The firmness selection can vary with the weight of the sleeper as well. The bulky sleeper should go for higher firmness, and slimmer one can do well with mildly firm toppers. What odor we are talking about? It is the smell that new items (mattress, toppers,) usually dissipate. Why do they do this? It happens when their volatile organic compound initiates breaking on opening. This odor usually lasts for a few days. However, it might make you uncomfortable. This is the reason; you should also consider the materials of your topper. The toppers that have the labeling of certain certifications can be considered safe for your health. One such certification is Certi-PUR US. If your topper has various certifications including the above-mentioned, you are good to go. However, there is also a good fact about this starting odor. This is about its being harmless. It won’t cause any serious harm. It is just uncomfortable and might cause a headache. How long I should expect my topper to function well? The durability of these toppers may vary from one to five year. However, it is a matter of brand, material, and quality as well. If you go for a reliable name and high-quality product, your topper will go well for multiple years. On the other hand, the low-quality topper could hardly make to the services for one year or even less. Besides purchasing top quality topper, its durability also depends on your way of using it. You should prevent it from facing moisture, liquid, and other stains. Regular cleaning can also enhance the lifetime of your topper. This factor, though the most important, cannot describe in simple words. Which price option is the best for mattress toppers? It all depends on your priorities and budget. However, to your convenience we can say, the good topper can range somewhere between $200 and $300. There are even expensive options as well. The more money you pay the better option you would get. However, this is not true in every scenario. There are many frauds cases as well, where sellers misguide you. In order to avoid such conditions, it is very important to do some proper research. After all, it is the matter of your peaceful sleep and your hard-earned money. Mattress topper prevents you from overspending the money by avoiding the need to purchase a new mattress. While at the same time, they aim to deliver quality sleep that would not be possible to achieve otherwise. They also help with dealing support and spinal alignment problems. You can even use them to customize only one side of your double bed. You may need the feel if you are the only side sleeper in your home. These toppers are highly beneficial. However, the problem arises when you can’t choose the appropriate option for your mattress. We understand the difficulty. Thus, in this write-up, we have provided reviews of 8 best mattress toppers for side sleepers. Going through them can help you with your decision making process. But if you’re still confused then go with our Editor’s pick i.e. ExceptionalSheets Topper. Bamboo material keeps the allergens away and helps you sleep cool and comfortable while the 100% satisfaction got you covered. Best Crib Mattress Reviews 2019 – Which Is for Your Baby and Toddler?